The first round was held at the office in Kampong Kdei. Staff members from Phnom Penh also gathered together there. Each JVC local office had been reflecting on their 2017 activities and operations, and having conferences for annual plans for 2018 during this spring (the blog about the conference for annual plans in South Africa can also be read here.) 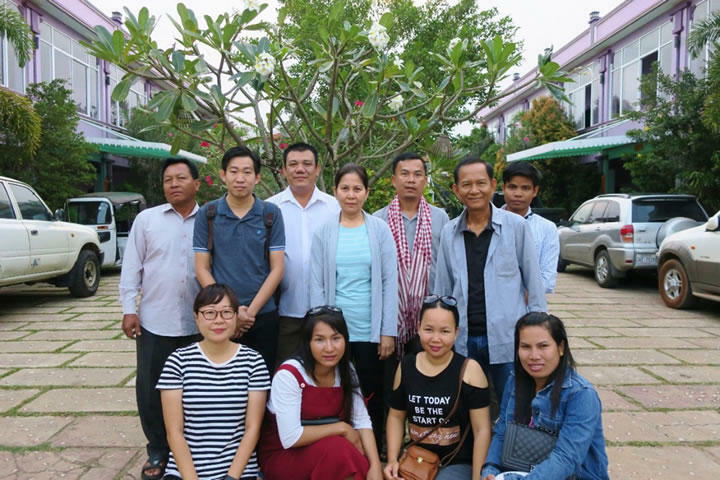 In Cambodia, all the staff members also gathered together and held the conference during the period of 12-16 February and 26-28 February. We rented accommodation for the second round of the conference and lodged together for two nights. 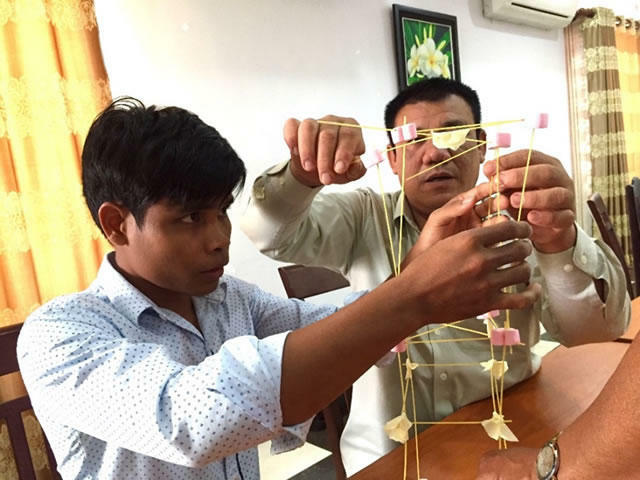 JVC in Cambodia has conducted food-processing trainings for farmers and afforestation at some schools. We discussed how these operations were utilized afterward, and to what extent they had been effective. While there were some farmers who started doing the food processing at home and some schools where trees were growing successfully, there were some cases in which a few farmers claimed that “there was not enough time for food processing” and some schools reported that parts of plantation “got eaten by cows.” After sharing this feedback, we kept having numerous discussions from morning to night about whether or not the trainings were effective and the timing of the afforestation was appropriate. After the discussions, we reconfirmed the importance of taking more time to hear the real voices of the local people in need, even if it is sometimes hard to take time to do so due to the daily duties. 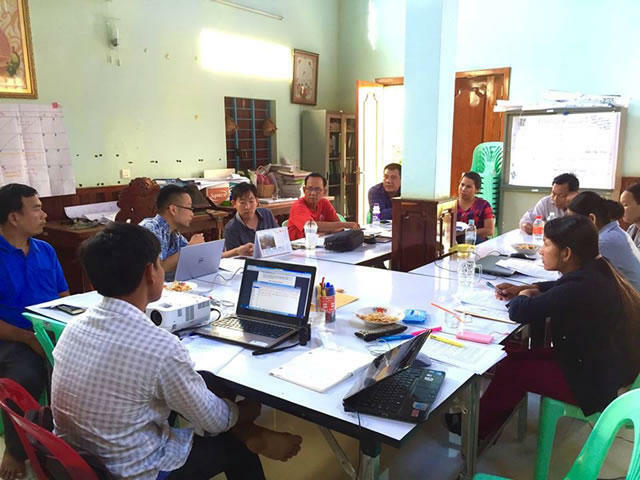 The team Phnom Penh (librarian staff, staff of general affairs, and accounting staff) discussing their plan. Kampong Kdei team showed outstanding teamwork! 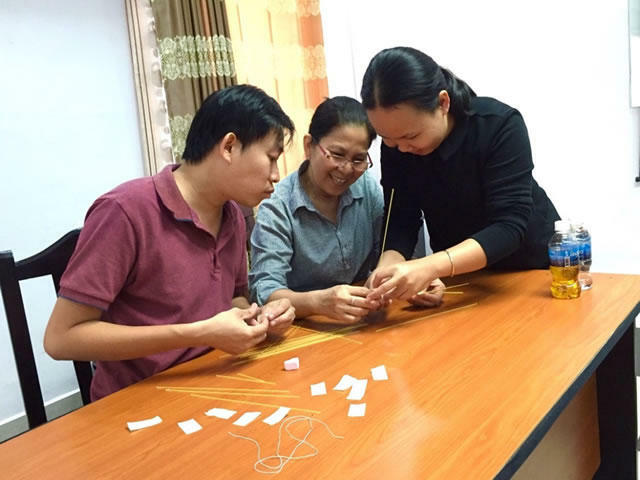 During the conference, we tried a workshop called “Marshmallow Challenge” as an icebreaker. 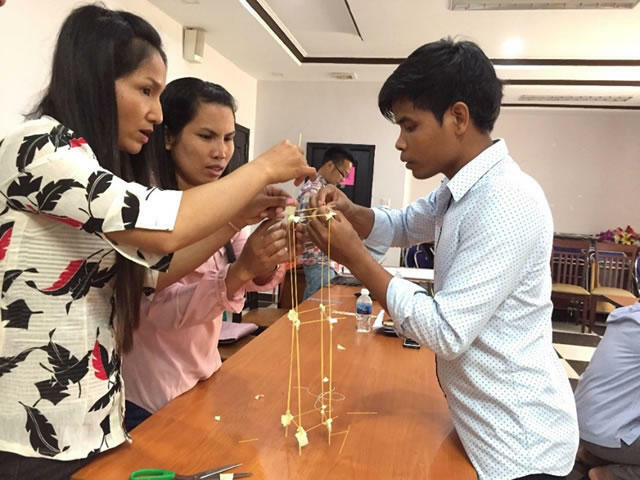 It is one of the famous teambuilding games where each team needs to build a tower in 18 minutes using a certain number of marshmallows, pasta, ropes and tape. The team that builds the highest tower wins. We had three groups competing with each other. 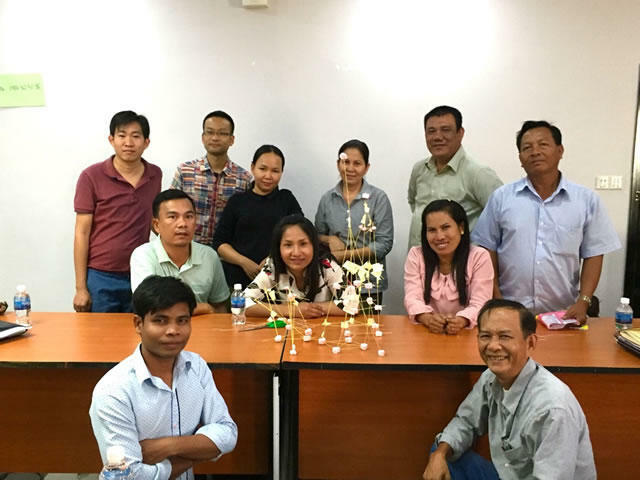 The first group was the so-called ’intellectual’ one composed of staff members of Phnom Penh, the second was a driver team in which well-skilled and safe drivers joined together, and the third consisted of staff members of Kampong Kdei who diligently conduct field work in local villages on a daily basis. The winner was team Kampong Kdei! The other teams focused too much on height, so their towers could not properly stand. The goddess of victory smiled at the team Kampong Kdei, since they had such great teamwork and they were also able to make a solid base. At the end of the workshop, we interviewed the winning team. The workshop was a precious opportunity for us to realize and learn the importance of teamwork. Everyone was extremely focused, more than ever before…! A commemorative photo with the winners’ work! The conference took a long period of time, and of course, there was not only a fun part but also a difficult part during the discussion. But the conference was completed with all the staff members’ efforts. The Tokyo headquarters will now deliberate our annual plan for 2018.